Sony Ericsson K800i is a digital camera, with the mobile phone, or is a mobile phone with digital camera, depends on how you definite a phone or a camera. K800i is a Cyber-shot digital camera and a 3G mobile phone in one body. K800i features a 3.2 megapixel camera with autofocus, image and video stabilizer and built-in Xenon flash. Beside, K800i also has BestPic technology that captures several images in quick succession with one press of the camera shutter. 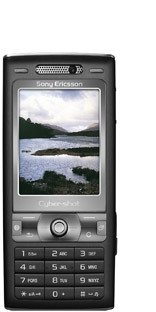 Sony Ericsson K800i Cyber-shot features MemoryStick Micro M2 card slot, UMTS / GSM 900 / GSM 1800 / GSM 1900 support, 2.0 inch 256K colors 240 x 320 pixels TFT LCD, Bluetooth plus Bluetooth Stereo (A2DP) support, USB mass storage device mode, FM radio, media player, and other standard phone functionality and productivity application. Hardwarezone reviews Sony Ericsson Cybershot K800i and concludes that K800i is a fun phone to have and we recommend it for those who don’t want to carry two separate devices. Feature wise, the K800 is quite similar to the K750 with the exception of 3G video calls and RSS that mobile warriors would especially when moving about. The only gripe we had was the low 15FPS of its video recording mode. In a nutshell, the Sony Ericsson K800i has almost all the features you would want in a modern nifty device. It is available now at a RRP of US$593 without operator plan. 3G reviews Sony Ericsson K800i 3G Phone and concludes with total score of 91% that the K800i is the closest a camera phone has come to matching the quality and functionality of a proper digital camera. Sony Ericsson has raised the mobile photography benchmark with the K800i. K800i is good for photographic performance that is striking and slick. However, no optical zoom for such a high-standing camera phone, and introduce yet another MemoryStick format.